In case you’ve been living under a rock, Marie is an organizing guru and author. A few years ago, she gained big notoriety when she wrote a book called The Life-Changing Magic of Tidying Up. It is based on her method of organizing, called konmari. To be fair, I have read the book and Marie is just about the cutest person I have ever seen. I absolutely agree with the idea that most people have way too much useless stuff. The proliferation of storage unit businesses alone should cause most people to shudder. And lest you think I’m a cynical monster, I really do appreciate her gentle and thoughtful approach to weeding out the unneeded stuff. I’m obsessed with her lovely folding technique. She seems truly genuine and I plan to continue watching the show on Netflix. 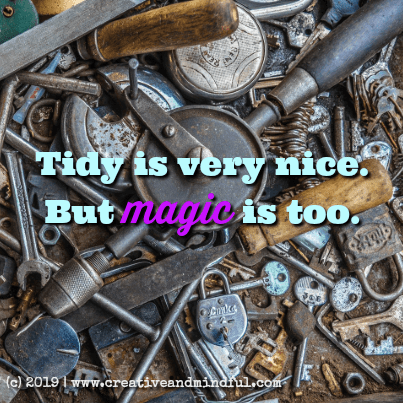 I also think the question “…does it spark joy?…” is an excellent way of approaching the often necessary task of culling through our things and selecting the stuff we no longer need. I think there are many people for whom konmari works. I’m just not one of them. I readily admit I have a lot of “stuff.” I also live in a house that was built in the 1850s; it is small, oddly shaped, and originally had no closets. Built-ins and bump-outs and storage-type furniture take up a bunch of room. Few closets, no basement, no garage… everything is pretty much on display just by virtue of the fact I literally have nowhere to hide it. I imagine visitors to my home thinking, “whoa, what a f#$%ing mess!” or “good lord, why do you have all this stuff? !” At least that’s my suspicion, based on actual comments. People can be so helpful when they share their judgmental inklings, you know? Here’s the thing, I’m an artist and a prolific maker. I’m a magpie and crazy sentimental. I was also fundamentally influenced growing up by a grandmother who survived desperate poverty during the Great Depression. I’m pretty in touch with my emotional damage and attachment to things. But the positive spin on that is: creativity, resourcefulness and inventiveness are really at the heart of why I hang onto stuff. I’m not a hoarder. I do get rid of things I no longer need. Sure, there are heaps and overstuffed drawers, but you can walk through my house without a map. I frequently organize and sort through things so I know what I have. I have storage systems that I change up or replace as needed. It probably doesn’t look great to an outsider but it makes sense to me. Like my grandmother, I tend to look at the future potential in things. §§ I’m the person all my friends (who, no doubt, have ridded themselves of everything konmari-style) come to when they need some oddball thing. Recently, I was mulling over how to solve one last detail in a historical costume project: the hat. Low and behold, a forlorn straw bowler I bought in the ’90s whispered from its dusty space in my studio. It was a quick, easy and thrifty refashion for my 1880s outfit. Then I embarked on a little side project to stitch something my husband requested. A quick dig through my fabric stash revealed a camo-effect shark print. I had actually considered re-homing this fabric several times – I have no idea why I bought it. But it was perfect for the project and it delighted him. THOSE moments of synchronicity spark so much more joy in my life than rigid organization ever can. Tidy is very nice. But magic is too. So, two thumbs up for all the neatly folded and organized minimalism on Insta and YouTube. But I’m gonna stick with my mess for a lil while longer. 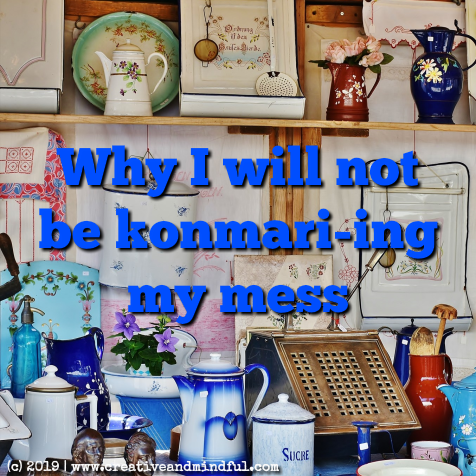 §§ Despite my grandma’s propensity for saving things, her home was so organized, clean and tidy she made Marie Kondo’s work look like a junkyard. Until the day she passed away at 92, I wouldn’t have thought twice about eating off her bathroom floor AND I always knew she could save the day – McGyver-style – with a rubber band, a button, a mason jar, and some string. ← Holiday Survival for Creatives: Got the Van Gogh Blues?